Meet Justice, a 1-year-old, domestic, short-haired cat. Animal care staff describes Justice as very sweet and loves attention. She also seems to love dogs. Justice is spayed, vaccinated for PRCC, rabies vaccinated dewormed, tested negative for FeLV/FIV, flea treated, and micro-chipped. Please consider opening up a heart and home to Justice. If interested, please call 740-335-8126 or visit with her at the Fayette Humane Society’s Adoption Center. Their downtown adoption center is located on the corner of South Main Street and East Street (use East Street entrance) in Washington C.H. Please remember that there are thousands of homeless animals in shelters waiting to be adopted. If considering adding a furry friend to the family, please adopt, don’t shop. 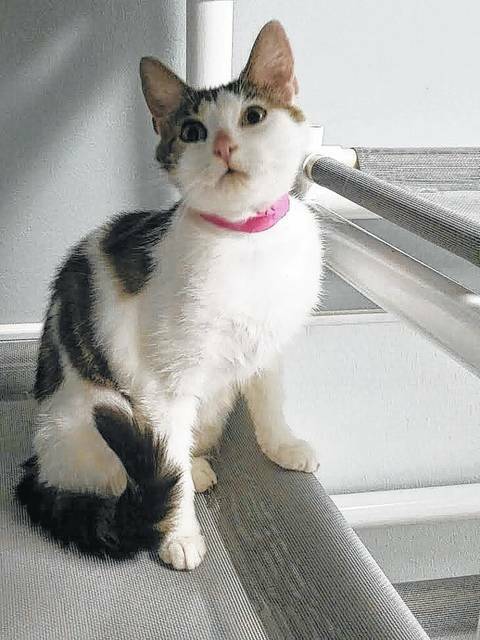 https://www.recordherald.com/wp-content/uploads/sites/27/2017/07/web1_Pet-of-the-Week-Justice.jpgMeet Justice, a 1-year-old, domestic, short-haired cat. Animal care staff describes Justice as very sweet and loves attention. She also seems to love dogs. Justice is spayed, vaccinated for PRCC, rabies vaccinated dewormed, tested negative for FeLV/FIV, flea treated, and micro-chipped. Please consider opening up a heart and home to Justice. If interested, please call 740-335-8126 or visit with her at the Fayette Humane Society’s Adoption Center. Their downtown adoption center is located on the corner of South Main Street and East Street (use East Street entrance) in Washington C.H. Please remember that there are thousands of homeless animals in shelters waiting to be adopted. If considering adding a furry friend to the family, please adopt, don’t shop.